Tuesday April 20th 1897 It was quite cold this morning but we washed. I got dinner and looked after my hens some. It rained in the afternoon but the clothes had got dry. Wednesday April 21st 1897 I ironed in the forenoon and did some baking. In the afternoon I worked out of doors a little while and then went over to see how Aunty was. Callie was there. Thursday April 22nd 1897 It was very warm for the season today. I got the work done up and dinner ready and early in the afternoon Will and I got ready to go up town. stopped at home awhile before going over to Woolfs to Jennies wedding. It looked like an awful storm coming up but it did not rain till we got back home. The wedding passed of very pleasantly. Jennie got some nice presents. Friday April 23rd 1897 We did not get up very early and as soon as we had breakfast started for home. It had quit raining. We found there had been a hard hail storm down here. I got dinner and took of some little chickens in the afternoon. 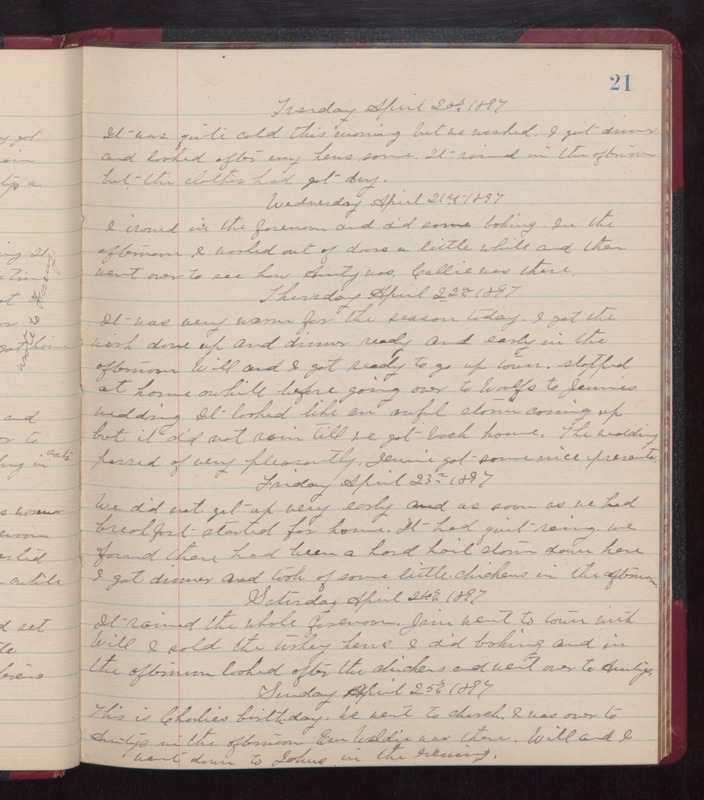 Saturday April 24th 1897 It rained the whole forenoon. Jim went to town with Will. I sold the turney hens. I did baking and in the afternoon looked after the chickens and went over to Auntys. Sunday April 25th 1897 This is Charlies birthday. We went to church. I was over to Auntys in the afternoon. Em Weldie was there. Will and I went down to Johns in the evening.